Technology integrator AVnew of Altamonte Springs, Florida has selected Analog Way’s NeXtage 08-4K and 16-4K seamless AV processors to drive LED videowalls and a projection display at a trio of churches throughout Florida. AVnew is a full-service AV and technology company specializing in working with houses of worship in central and south Florida. Parente calls the NeXtage family “our go-to video switchers/processors,” which are equally adept at driving large-scale LED videowalls and big-screen projection displays. 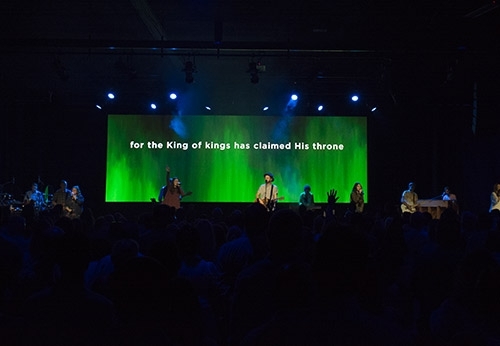 For Converge, a church planting organization headquartered in Lake Nona, AVnew installed a NeXtage 16-4K for the 30 x 10-foot ROE CB3 LED videowall in the group’s main event space. The multi-purpose space hosts non-profit events and is home to a local church for its weekly services; the LED videowall, which features Brompton processing, acts as a presentation and scenic element. Parente reports that Analog Way provided extra support for the three projects during the installations. They were able to ensure smooth edge-blending for Life With Life Church and seamless processing of the custom resolutions for the LED walls at Mosaic Church and Converge.